As the world’s population increases and the demand on our power grids grows, how will we keep the lights on? That’s where Kansas State University fits in. Through the Electrical Power Affiliates Program, the College of Engineering is leading the charge in solving future problems for the power and energy industry. The program, housed in the electrical and computer engineering department, partners with eight industry organizations. Since its establishment in 2008, the Electrical Power Affiliates Program has supported relevant research projects and provided engineering students with real-world experience, said Noel Schulz, program director and the College of Engineering’s associate dean for research and graduate programs. 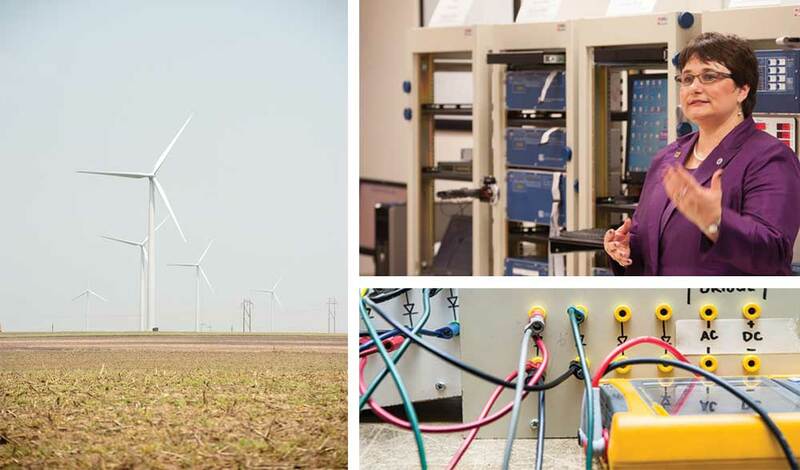 A key component of the Electrical Power Affiliates Program is providing support for faculty and student research projects on numerous relevant topics: wind power, smart grids and electric vehicles. For the past three years, the program has given more than $110,000 each year to support small projects for undergraduates and graduate students. During that time, 18 faculty and staff from seven departments and Engineering Extension have received more than $300,000 in support for their activities. Behrooz Mirafzal, assistant professor of electrical and computer engineering, used Electrical Power Affiliates Program funding and other funding sources to develop a new research power electronics laboratory. Because of this preliminary research, Mirafzal was able to apply and receive a $400,000 National Science Foundation CAREER award to help develop grid interactive converters for the next generation of power grids. “Programs like EPAP support the faculty members who are active in power and energy areas to run small projects and obtain preliminary results, which are typically required for preparing large grants,” Mirafzal said. The Electrical Power Affiliates Program is key to the university’s — and the state of Kansas’ — goal of providing more engineers, Schulz said. The program gives engineering students the opportunity to research, learn, network and engage in professional development. In 2014, 22 students attended a Chicago conference, presented posters and papers, and interacted with industry members. Additionally, the Electrical Power Affiliates Program sponsors EPAP Day every fall semester. The annual event includes a mini career fair, mock interviews for students, lunch, research poster sessions and opportunities for students to network with power and electric companies.